Berrien County, Michigan. 08 November 2015. The immaculate, fresh, plumage is all juvenile (i.e., 1st basic). The pale edges to the upperparts and pointed primary tips reinforce the fact that these are all 1st generation feathers. I don't blame those folks who identified this month's bird as a young Thayer's Gull - indeed, there may be some thayeri that match this. But this isn't a Thayer's. 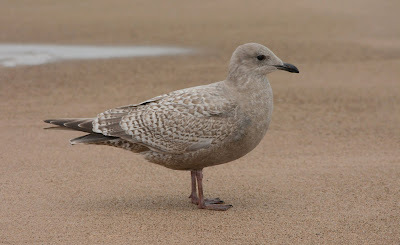 I identified this month's quiz bird as a juvenile American Herring Gull. The bill seems petite and shorter than usual, although that's likely because it's still growing. Notice how the base of the lower mandible is paling - a subtle hint that this may not be a Thayer's as that species does a better job of keeping a black bill at this age than other large gulls (but it's not terribly uncommon for a 1st cycle Thayer's to show a paling bill, especially late in the winter season before departing north). In Thayer's, the outer primaries are typically paler than the "almost black" appearance seen here, and the edges to those primaries are paler - often more so than the quiz bird. Also, most juvenile Thayer's will show tertials that are a smidgen paler than this. LaPorte County, Indiana. 27 November 2014. Note that the outer primaries are more brown (compare with the black bill), with paler proximal edges. The upperwing coverts, too, look more marbled and frosted than in most juvenile Herrings. Brevard County, Florida. 25 January 2016. Structurally, the bird is plump and the head is large and blocky, complemented by a heavy bill. The primaries are dark - darker than the bill. Not much about this bird suggests Thayer's Gull. My purpose in selecting a fresh juvenile Herring for this month's quiz is two-fold: To point out just how immaculate some juvenile American Herrings can look in their hatch year, and two, to emphasize the importance of how a date can greatly aid in the identification process. Without a date, it's difficult to gain any appreciation for seasonal factors such as molt and wear.